We love getting visitors at Fountain Community Garden. Let me tell you about a special visit that we had by a very cool local student run organization. 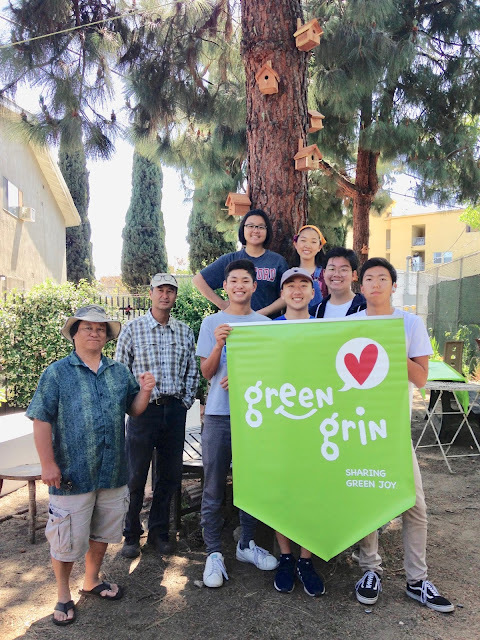 On April 28, Green Grin.org, a high school student-run organization that focuses on advocating for and acting on environmental issues in our society visited Fountain. They gathered in the garden with Dan, our master gardener, and presented the garden with a very special gift. They built and set quite a few birdhouses around the garden. There are so many benefits of attracting birds to our gardens. Birds help control pests, weed control, and flower pollination. 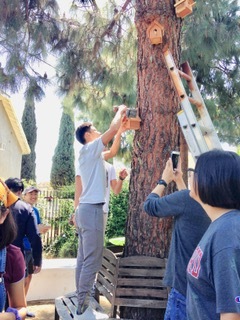 Birdhouses also offer a safe place for birds to build their nests and get shielded from the elements. Thank you so much Greengrin.org for the lovely birdhouses. We love getting visitors and volunteers. If you or your organization would like to visit Fountain Community Garden, please send us an email for more information. I want to read more articles from you. They are so great. I apply the advice in real life. Hope that you will write more and more. Good luck! According to the statistics of hospitals, more and more people are suffering from obesity due to the use of preservative water, many people with cancer by using flavored water ... Consumers to protect their health , they have chosen to use pure water, preservative-free water made from bottled and bottled pure water business lines. It can be said that the demand for pure water of the people is very high. The greater the demand for pure water, the more open the opportunity for investors to focus on pure water production and trading in the country and abroad. Thanks for sharing the post..I discovered your online journal utilizing msn.Topic of web journal is great there is just about everything to peruse. I don’t realize who you’re but definitely you are going to a famous blogger if you are not already Cheers! I’m curious to find out what blog platform you’re using? I’m having some small security problems with my latest website and I would like to find something more secure. Do you have any recommendations? Found in 2009, our community garden is located in East Hollywood by near iconic 101 Freeway and Fountain Avenue. Officially in Hollywood District 13, our mission is to provide safe green space to our community members through inclusion of all ethnic and economic backgrounds. Currently we have over 100 gardeners working on 65 plots to plant, grow and provide fresh fruits and vegetables to themselves and their families. In doing so, we strive to provide an open environment for the benefit of our community and environment. Regular contributing members of this Website are Alex Alferov, Dan Fujiwara, and Laura Guzman- all community residents of Hollywood District 13. Alex is one of the garden's founding members who resides near the garden in his art studio. Dan is our Master Gardener, who also professionally teaches gardening. He holds many workshops in-and-out of the garden, where he offers information, advises and tips to assist all levels of gardeners. Laura is a professional chef who teaches cooking to children to promote healthy eating habits. She plays a vital role in bridging various cultures in the community garden.